VISALIA – The first U.S. archer to win a Paralympic Games gold medal since 1984 will headline the Kaweah Delta Community Health & Fitness Expo and 5th Annual Rehab Reunion on Saturday, Oct. 5, in Visalia. 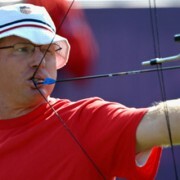 Jeff Fabry, who took the gold last year in London and become the first gold medalist for USA Archery in the Olympic or Paralympic Games since 1996, will show expo attendees the rewards of perseverance as he performs archery demonstrations and signs autographs at the event. He was chosen to headline the expo because the event is in part meant to celebrate and inspire patients of Kaweah Delta Rehabilitation Hospital who have recovered or are on the road to recovery following traumatic injuries. Following the loss of his limbs, Fabry began shooting arrows with the use of his teeth and a mouthpiece. He was soon a regular competing at a national level against able-bodied individuals until one day, it was suggested to him to try out for the USA Archery Paralympic Team. For Fabry, the rest was history, including his 2012 performance in London that made the history books. None of it would have happened if Fabry would have let his disability get the better of him, he said. Expo festivities are set to begin at 8 a.m. on Oct. 5 with a 5K Harvest Run and 1K Minds ‘N Motion Brain Injury Awareness Walk and will continue through 12 p.m. with festivities including archery demonstrations, a pancake breakfast, community booths, free screenings, a teddy bear clinic and more at the Kaweah Delta Rehabilitation Hospital, 840 W. Akers St. in Visalia. For a schedule of events, visit www.kaweahdelta.org/events or call (559) 624-5985.